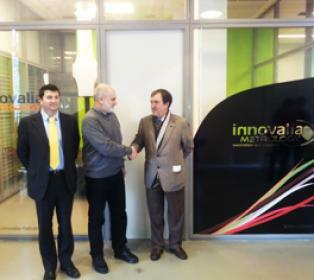 One of the activity lines of Elgoibar Machine-Tool Institute is its strategic alliances with advanced technology-based companies, and in this sense, it has signed a new collaboration agreement with TRIMEK-INNOVALIA. This company, from Alava, belongs to AFM, the Spanish Association of Manufacturers of Machine-Tools, accessories, components and tools. With this agreement, the two entities will develop a series of joint work lines, the most noteworthy of which are training services for companies, students and teaching staff of the centre; technical dissemination and promotion activities; activities geared towards the improvement of training quality; research and development projects related to 3D metrology, and the assignment of updated equipment and tools that will permit training in whatever the work environment demands. To develop this activity, the IMH offers TRIMEK a multi-function room of 160 m2, in which the TRIMEK-IMH Precision Centre will be installed. TRIMEK , on its part, will install an M3 Gage system in this precision centre equipped with OptiScan non-contact 3D laser sensor, and it will provide the centre with 10 M3 compact and M3 tablet licences. It will also provide development possibilities in training and projects of IMH with training in basic and advanced metrology; 3D scanning with CMM seminars; metrology related to point clouds, and reverse engineering; AUKOM courses, and from time to time it will enable the use of the TETRACHECK, a fast three-dimensional machine verification system.